No More Nickname: “Drew” is Dead, Long Live Mr. Gilbert! I’ve never been much for nicknames. However, in October 2007 when I began teaching for DeVry University in Bakersfield, students in my first class affectionately (well, I think it was affectionately) bestowed the nickname “Drew” upon me. Apparently some of my students felt I resemble comedian, actor and current host of The Price is Right, Drew Carey. I don’t know if this is really a compliment, but I am not sure it is a good thing to look like him (maybe looking like him when he was in the Marines is okay)! 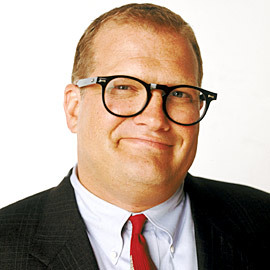 Sure, I am a male Caucasian with a few extra pounds and glasses, but Drew Carey is definitely not my doppelgänger. Brad Pitt, maybe, but Drew Carey, not a chance! Incidentally, a colleague claims I remind him of George Clooney. As much as I would like to embrace that idea, I am realistic enough to know that if I had to choose between the two options, I certainly (and sadly?) resemble Drew Carey much more than George Clooney. In the months since my “nickname knighting” I embraced my alternate identity, feeling it was a humorous way to relate to my students and provide some comic relief. I felt as if I had been accepted by my students and the nickname, regardless of what it actually was, served as an outward indicator of their “approval” of me in their social circle. The nickname was a way to break the ice and help them learn. I didn’t mind that the joke was on me if enabling them to call me it allowed them to overcome their fears about higher education. With the start of each new session I would introduce myself as “Mr. Gilbert, but you can also call me Drew.” Initially, during the first few months after the school opened — when my classes consisted primarily of many of the same students (with a few new additions each session) — the nickname seemed harmless enough. However, over the past few months the campus has grown exponentially. Impressively there are students and even new faculty members who I now barely know — it is an exciting time to be on campus. Classes have grown to healthy sizes and I no longer see that initial group of students quite as often. With the start of the most recent session, suddenly introducing myself as “Drew” seemed awkward — as if the joke was old and no longer funny. Although a few students who were in on the initial naming were still around, I felt like most of the students to whom I told my nickname simply didn’t get it. They seemed to wonder why, if my last name is Gilbert and my first name is Matthew, was I telling them to call me Drew? Besides, having “two first names” is confusing enough — sometimes a student is unsure if I am “Mr. Gilbert” or “Mr. Matthew.” Why make things harder than they need to be?! Most importantly, I began to realize that there is a reason for titles and formally addressing someone. I am not big on pulling rank, but I did start to feel that having my students address me with my nickname was too casual — and doing so was starting to erode my authority in the classroom. It was not an overt feeling, just an anecdotal realization. Sure, I enjoy creating a fun and welcoming classroom environment, but just as I know that parents can’t always be a friend to their children, teachers can’t always be friends with their students. Sometimes someone needs to be in charge — even if its just to keep things on track. I therefore decided to kill off my “Drew” nickname as of Monday, July 28, 2008. May it rest in peace. Burial services will be private. In lieu of flowers please PayPal cash donations! I am still fine with my “old” students still referring to me as “Drew” because they created the nickname and it still seems to work with them as a term of endearment. Drew is dead. Long live Mr. Gilbert! The Tennessee Board of Regents reports that summer enrollment in online courses is up 29 percent this summer over last year. At Brevard Community College, in Cocoa, Fla., summer enrollment in online courses is up nearly 25 percent. Harrisburg Area Community College, in Pennsylvania, saw its summer online enrollment rise 15 percent to 20 percent. At Northampton Community College, summer online enrollment is up 18 percent. The SUNY Learning Network, the online incarnation of the State University of New York, offers prospective students access to an online calculator that helps them determine how much they will save in gas costs by taking classes online. Colorado State University, which is launching a new online program this fall, has decided to waive the program’s $50 application fee to attract more students concerned about gas prices. Despite the reported increase in online enrollments, administrators at the University of Phoenix, the largest provider of online education, repot that there has not been a spike in online enrollments this summer nor have representatives heard much about gas prices affecting students’ choice of formats. This might be due in part to Phoenix’s ground classes being designed to minimize drive time by meeting just once a week for four-hour sessions, with textbooks and library services delivered online. The evening courses I teach for DeVry are designed similarly: classes meet once a week for four hours with an online component designed to provide two to four additional hours of educational experience. That being said, I still have students who admirably drive upwards of 30 miles to the campus from places like Delano, Wasco and Shafter. I also have one student that drives more than 40 miles from Lake Isabella! I suspect that as gas prices continue to climb there will be increased demand for online classes. Anecdotally speaking I have seen an ongoing increase in the advertisement and availability of online courses — both individual classes, certificate programs and degrees. While I can’t verify this, I feel as if I have seen more schools offering additional programs during the past few months. Likely, if it is true, it is merely a coincidence, because developing and launching an online learning experience is not something you can do in just a few months. Nevertheless, as an online adjunct instructor and as someone who feels technology can both increase the availability of education and enhance a student’s ability to learn (in classrooms or online), I am pleased to see the increase in online education — whatever the reason might be. Personally, I welcome additional opportunities to teach online because I would appreciate a chance to save a few (hundred) dollars in gas! What Does a Scotsman Wear Under His Kilt? Don’t Ask Wikipedia! If you’ve ever been curious what a Scotsman wears under his kilt, don’t as Wikipedia! According to a June 21, 2008 Scotsman article by Martyn McLaughlin the Scottish Parent Teacher Council (SPTC)contends that Wikipedia and similar online research sources were to blame for Scotland’s falling exam pass rates. Wikipedia and other online research sources were yesterday blamed for Scotland’s falling exam pass rates. The Scottish Parent Teacher Council (SPTC) said pupils are turning to websites and Internet resources that contain inaccurate or deliberately misleading information before passing it off as their own work. The group singled out online encyclopedia Wikipedia, which allows entries to be logged or updated by anyone and is not verified by researchers, as the main source of information. Eleanor Coner, the SPTC’s information officer, said: “Children are very IT-savvy, but they are rubbish at researching. The sad fact is most children these days use libraries for computers, not the books. We accept that as a sign of the times, but schools must teach pupils not to believe everything they read. Alan Johnson, the UK Education Secretary, was lambasted earlier this year for suggesting the website could be a positive educational tool for children. He described the Internet as “an incredible force for good in education”, singling out Wikipedia for praise. Boasting over two million articles, Wikipedia is used by about 6 per cent of Internet users, significantly more than the traffic to more authorised sites, such as those of newspapers. Its articles are mainly edited by a team of volunteers. Wikipedia was really a trailblazer in the current trend of virtual communities of practice, an area of my academic research interests. However, I know full well that whatever I read might not be accurate. I once heard it said that Wikipedia is a great place to start your research, but a bad place to end it. I feel that is an accurate assessment. I personally enjoy exploring Wikipedia and often find I end up on a page I never imagined I would find. As an adjunct instructor, I go to great lengths to explain why Wikipedia is not an ideal source for research information — precisely for the reasons mentioned above. I explain that they can begin their research at Wikipedia — as it is usually one of the top five pages to appear following a Google search — but I tell them to follow the links to the resources cited on the page itself. However, I am admittedly a bit of a hypocrite as I frequently link to Wikipedia pages in this blog due to the ease with which pages relevant to my topics can be found. Without question, Wikipedia pages are a great clearinghouse of information — a true crossroads of knowledge — and for that reason alone the site is a useful tool. But, its greatest strength is also its greatest weakness — one that will forever exist so long as the site remains as it is now. I recently demonstrated how easy it is to change a page on Wikipedia to one of my English classes by changing the Wikipedia page for comedian Carrot Top to indicate that he had died unexpectedly on that date. I was even able to change to biographical information in the box that appears in the upper-right-hand corner of the page. In fairness to Wikipedia, one of their editors discovered the false entry and deleted it within seven minutes. Still, seven minutes is plenty of time for someone researching comedians to have found the page and added a citation to their paper that Carrot Top had indeed died. So I really can see both sides of this issue — though as an educator I make sure my students understand the pros and cons of Wikipedia. Just like the students mentioned in the Scotsman article, I am likely to conduct my research virtually instead of physically in a library. It is hard to not do so with resources such as ProQuest making almost anything you need available at the click of a few keys. The main issue is to teach students how to properly conduct research and to ensure they understand why certain sources are more credible that others. Sometimes this can be difficult to communicate, especially when it comes to controversial topics for which there might not be a great deal of mainstream research materials available. Clearly technology offers education an immesurable advantage, but the key is to learn to control it without letting it control us.